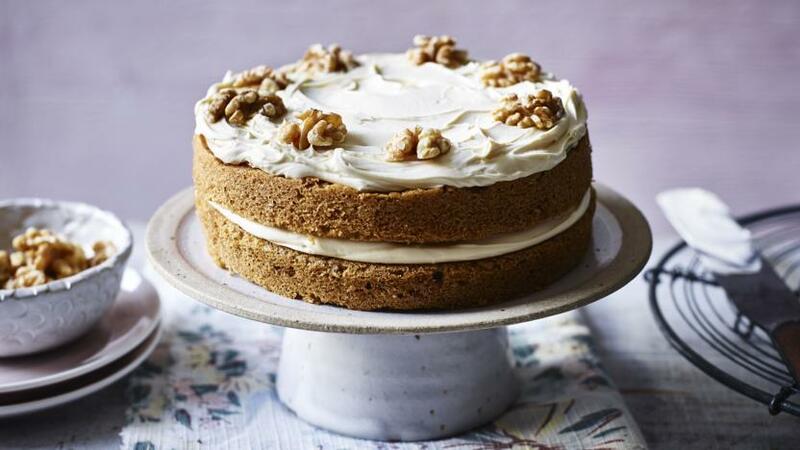 Mary Berry makes it easy with this delicious coffee and walnut cake. It makes a great treat for Mother's Day. Equipment and preparation: You will need two loose-bottomed 18cm/7in sandwich tins. Preheat the oven to 180C/160C Fan/Gas 4. Lightly butter two loose-bottomed 18cm/7in sandwich tins and line the bases with baking paper. Put the butter, sugar, eggs, flour, baking powder, walnuts and coffee essence in a large mixing bowl and beat together (using an electric hand whisk if you have one) until well combined and smooth. Bake for 20–25 minutes, or until an inserted skewer comes out clean. Leave the cakes to cool in the tins for 5 minutes, then run a small palette knife or rounded butter knife around the edge of the tins and carefully turn the cakes out onto a wire rack. Peel off the paper and leave to cool completely. For the filling and topping, beat the butter and gradually add the icing sugar. Add the milk and coffee essence and beat until smooth. Choose the cake with the best top, then put the other cake top-down onto a serving plate and spread with half the coffee icing. Sandwich together with the other half. Ice the top of the cake and decorate with the walnut pieces to serve.